A Salafist militant group on Saturday claimed responsibility for two rockets fired into southern Israel from the Gaza Strip. An Israeli military spokesman told AFP on Friday that the two rockets were fired by Palestinian militants, exploding in open fields causing no casualties or damage. The Salafists also demanded Gaza’s Hamas rulers release one of its members, Mohammed Rashwan, who was wounded last month in an Israeli air raid against the southern Gaza town of Rafah. Israeli fire killed six Palestinians in Gaza this week, three by a tank shell east of Beit Hanun and three in an air strike on a car in the Al-Maghazi refugee camp in central Gaza. Palestinians said all of the dead were civilians. The Israeli military said it had targeted militants preparing strikes. 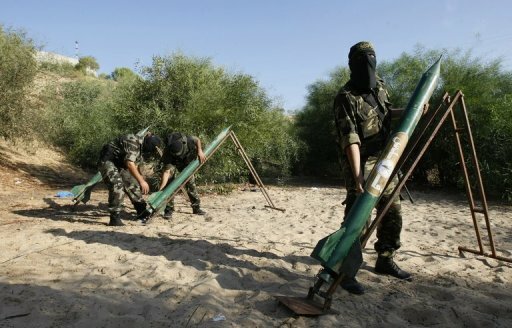 Palestinian militants have recently stepped up rocket fire on southern Israel, causing damage but no casualties. Despite an informal truce between Hamas and Israel, tensions flare periodically on the Gaza-Israel border, with militants firing rockets at Israel and the military launching retaliatory air strikes. The last major flare-up was in June, when militants fired more than 150 rockets at southern Israel, wounding five people, and Israel hit back with air strikes that killed 15 Palestinians.